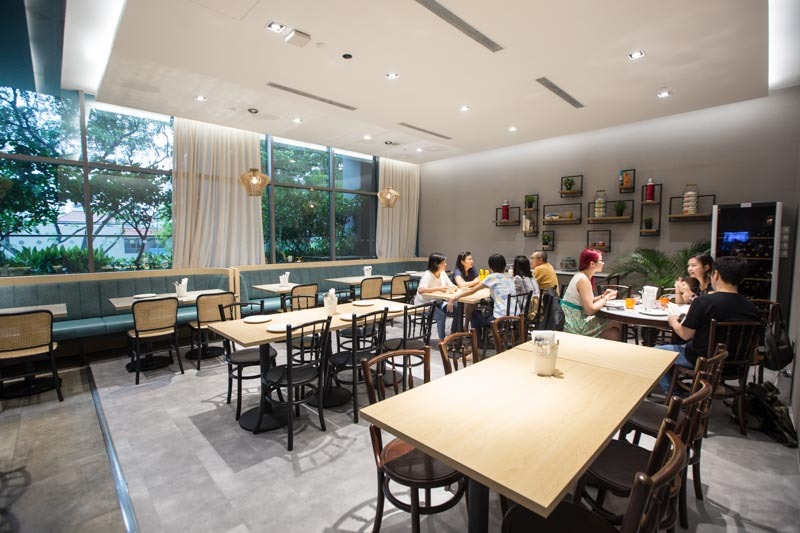 Singaporeans may be lamenting the loss of the kampung spirit, but one chef is trying his best to bring it back with a new communal dining concept. 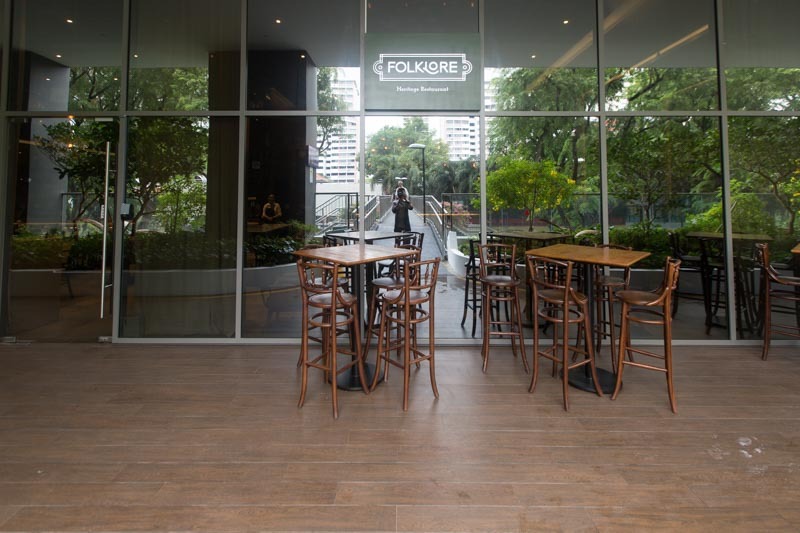 Folklore Restaurant at Destination Hotel is helmed by Eurasian-Peranakan chef, Damian D’Silva. All the dishes here in Folklore are created from scratch and are made from home recipes. Rich in both heritage and flavour, his ethnic-fusion dishes are perfect for sharing. 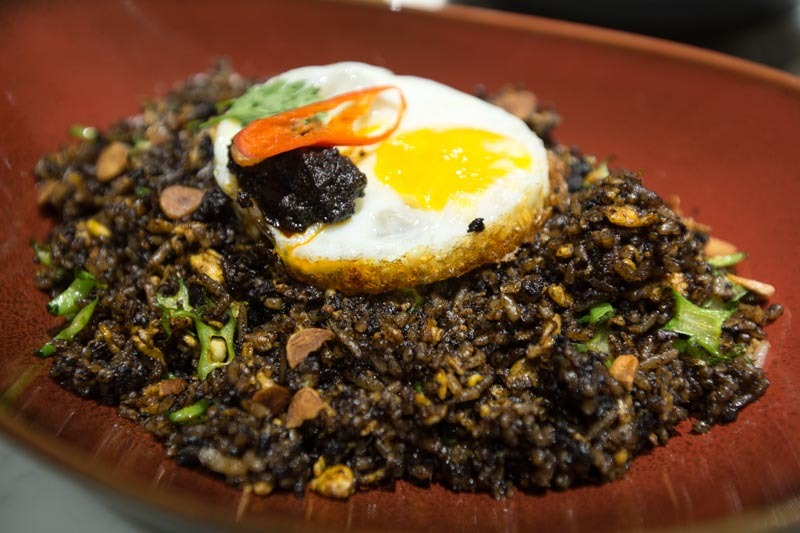 A must-try is the Sambal Buah Keluak Fried Rice ($22++). 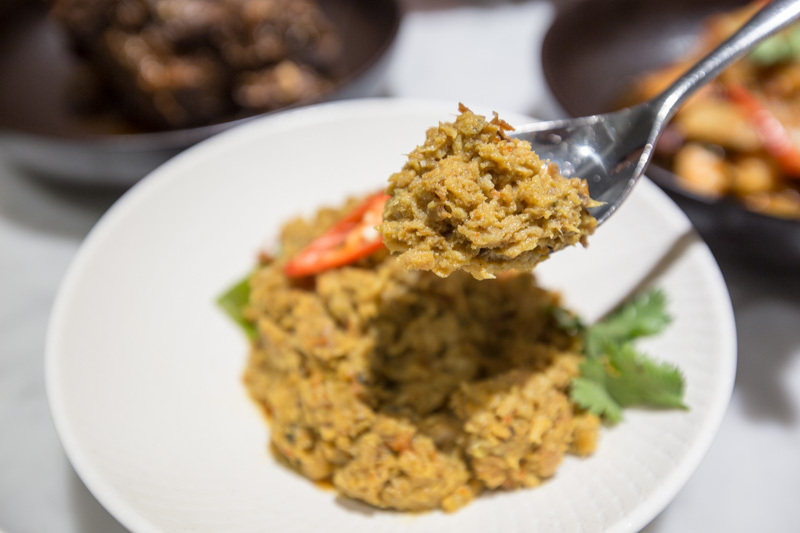 The meat from the buah keluak is extracted and blended with minced pork – this gave the nutty buah keluak a wonderfully subtle meaty flavour. 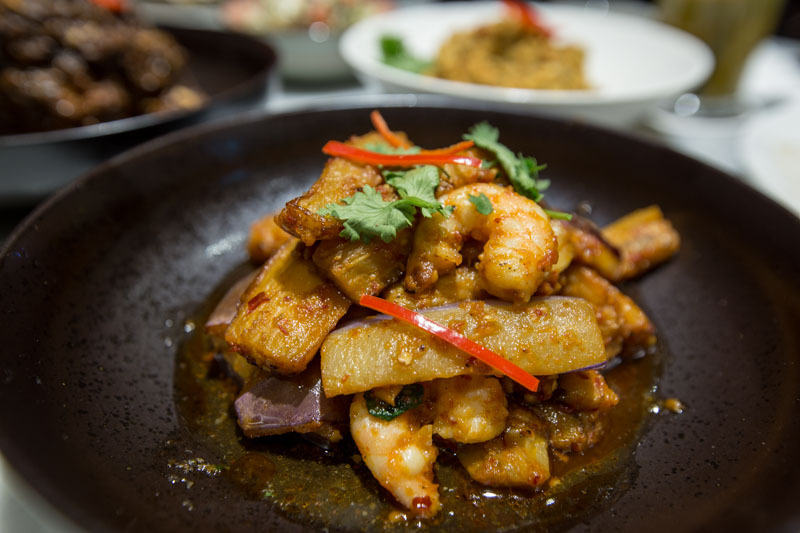 But the highlight of this dish is the sambal paste; made up of chilli, shallots, candlenuts, shrimp paste and lemongrass, it hit with just the right amount of spiciness. Coconut milk completes the fragrance of this dish – the last ingredient to be added, the milk-drenched dish is simmered until dry. Result? This mouthwatering fried rice that I couldn’t get enough of. Better yet, the dish is topped with a fried egg that oozed buttery, savoury goodness. The Babi Assam ($22++) was a dish I enjoyed so much, that I just couldn’t seem to stop myself from sneaking more pieces onto my plate. Slightly sweet and smooth as butter, the fatty layer almost melted in my mouth, a result from long hours of cooking. 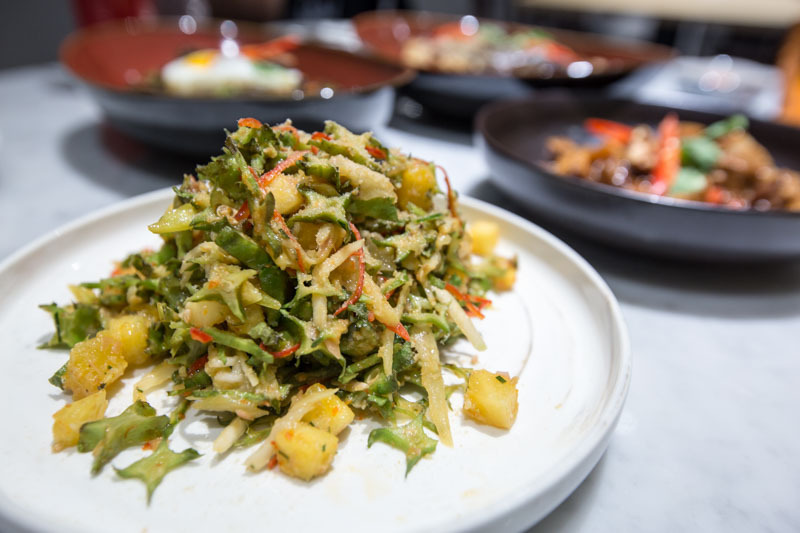 Few dishes taste more like hearth and home than the Peranakan Chap Chye ($16++). Simmered with prawn and pork stock, this variation of chap chye doesn’t use dried shrimp – great for diners who are not too keen on the strong, hae bee flavour. Aside from the rich flavour of the prawn and pork stock, the beancurd skin also added an intriguing texture to the dish. Chewy yet smooth, this made a stark contrast to the softer ingredients like the sweet and mushy cabbage. After having the above heavy dishes, the Four-Angled Bean Salad ($12++) neatly cleansed my palate. Pineapples, green mango and lime juice added a zesty balance to this refreshing but spicy salad. Diving back into the rich heritage cuisine was the Beef Cheek Rendang ($32++). A hulking portion full of meaty goodness, the dish comprises an entire beef cheek from New Zealand. 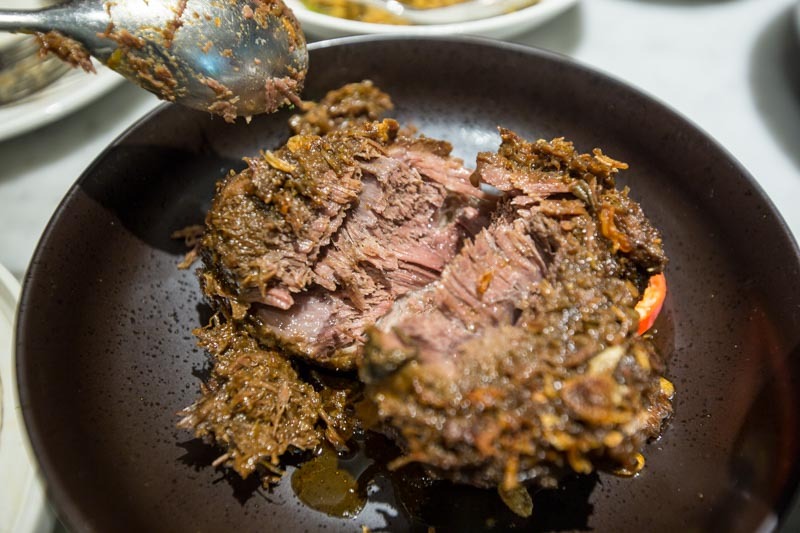 Dried spices such as coriander, cumin, and the chef’s special garam masala added an extra oomph to the beef chunks. Cutting it with a spoon was easy – the tender meat parted into bite-sized chunks of melting goodness. 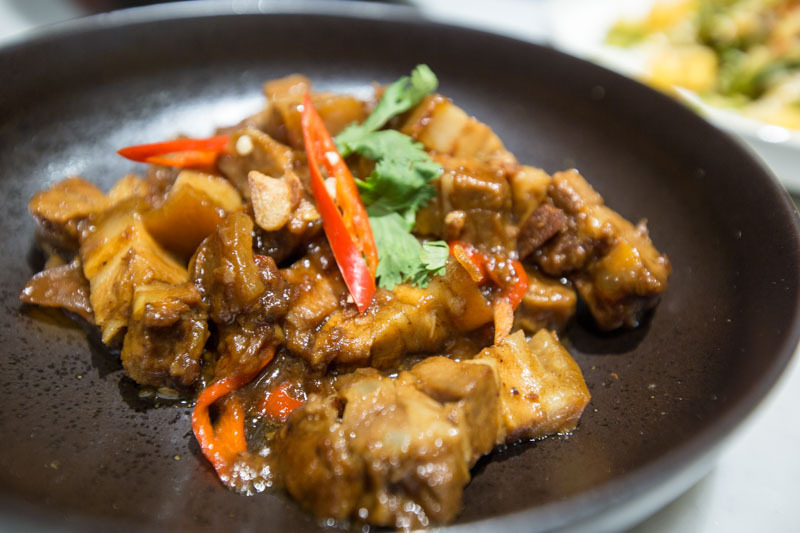 A lighter meat option came in the form of Singgang ($20++). Described as a dish of labour, the wolf herring fish is cooked for 45 minutes with a spice paste of rempah (tumeric), fresh chillies, galangal and bruised lemongrass. The painstaking hour-long deboning only takes place after the cooking – ensuring that not only do the spices seep into the fish, but vice versa as the fish flavour is infused back into the spice paste. This creates a complex dish that has layers of flavours; the spices and fish blended into each other beautifully in my mouth. Another dishes that stood out was the Sambal Juliana With Fried Brinjal ($14++). Mushy, spiced eggplants dominated the dish, and the heat from the sambal complemented the rich eggplant flavour. Fresh prawns were also added to the dish, for an additional hint of sweetness. More importantly, this heritage dish comes with a bit of history. 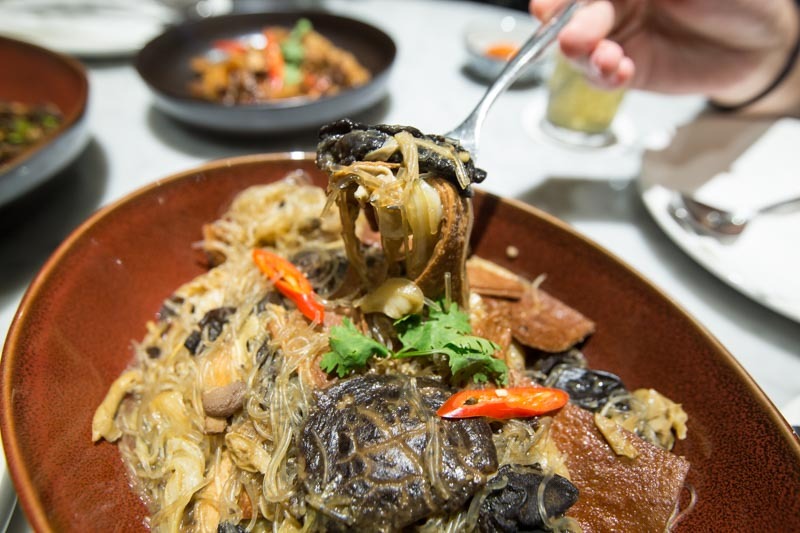 Chef Damian’s Eurasian grandfather told him a story about a ship captain who wanted to know the name of this dish that his worker had prepared. And in a burst of spontaneity, the worker named it after his wife, Juliana. Little scraps of story like this make the dining experience more than just about the food – it’s about the past, and the heritage too. 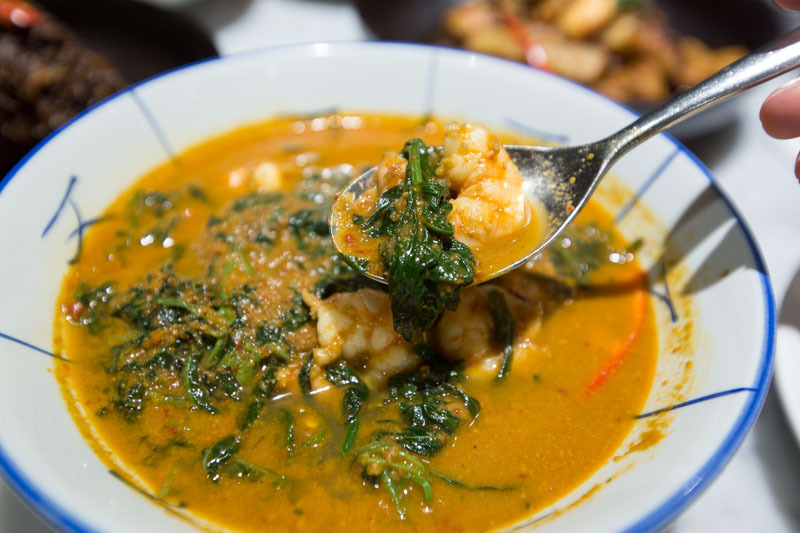 The Masak Lemak ($14++) is a mostly vegetable dish with sweet potato leaves, local spinach and kang kong. The kick from the spice helped to ground the stewed vegetables, and the coconut fragrance added a twist to the vegetable-heavy dish. Fresh prawns also join the vegetables in their delicious dip. Added in just before the vegetables, these juicy prawns retained their briny flavour. Finally, to refresh our palates after a heavy meal, we were treated to a bowl of Chilled Tofu With Pidan ($12++). Served with pickled radish, this clean-tasting tofu dish came as a relief after the spicy heat from the other dishes. 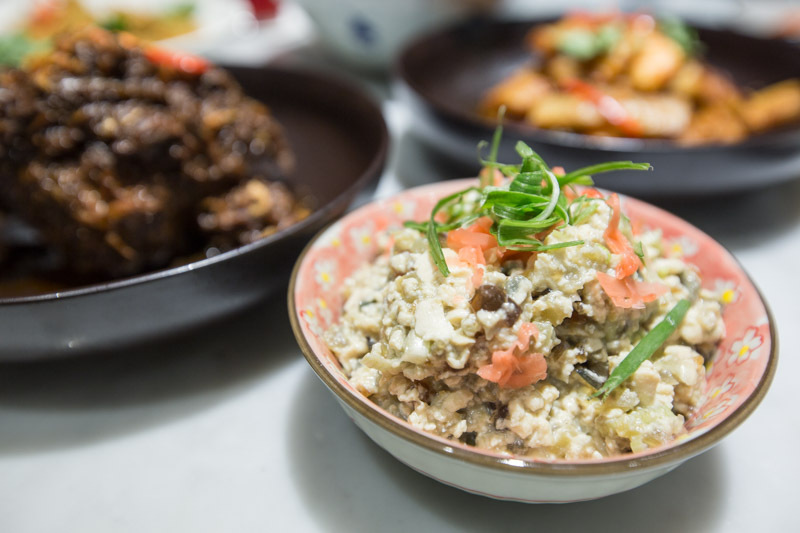 The century egg and tofu blended together to create a soft, smooth texture in my mouth, and the addition of the radish added a crunch that undercut the richness. Of course, there’s always room for dessert, so we tried two different items on the menu. The Kueh Bengkah With Ice Cream ($10++) is made with freshly grated tapioca, and baked ’til the top layer is a crisp contrast to the dense cake. The slightly sour finish of the gula melaka syrup added another dimension of taste to the cake. With its dual texture of creamy and chewy, this dessert dish was definitely worth the calories. 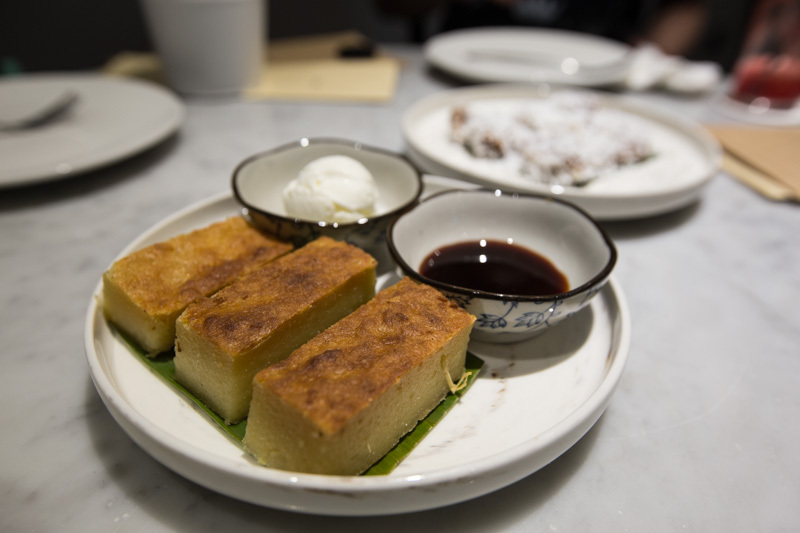 But my favourite dessert of the two has to be the Kueh Kosui ($6++). 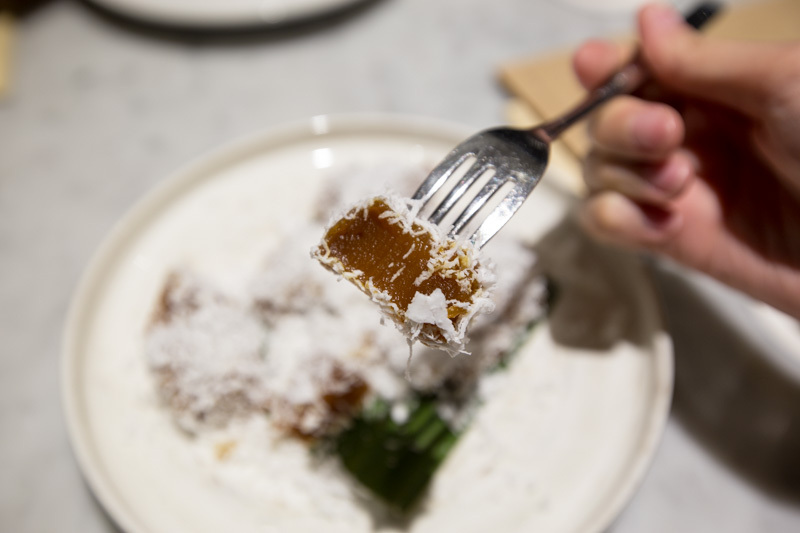 Sticky and sweet, with liberal sprinkles of freshly grated coconut flakes, this steamed tapioca kueh practically dissolved in my mouth – it was so soft, it almost felt liquid. The gooey kueh is the new winner of my comfort food list, simply because each bite brought such a homely, wholesome feeling. Little wonder then, that Chef Damian envisioned Folklore as a way of storytelling through food. Every dish brings you back into the family kitchen, even as you experience new and exciting heritage food recipes. Remember to bring enough friends to share!